If you’re like our adored customers, you’ll likely feel surprised by how frequently you reach for your lavender essential oil, and even more grateful for how long this extra-large bottle lasts! Relax and refresh your home or office – place it onto a cotton ball or essential oil diffuser. Stop itching and swelling on insect stings and bites - dab it on! Extracted at 100% Purity & Potency, then tested and bottled right here in the USA. And because it's the biggest bottle you’ll find, you’re getting an UNBEATABLE VALUE for health, home and happiness. If you’re looking for the purest Lavender Essential Oil at the best value then we welcome you to click Add to Cart now. You’ll feel 100% satisfied, guaranteed. Or your money back, no questions asked. PUREST QUALITY LAVENDER OIL, BIGGEST BOTTLE: If you've done your research you already know most lavender oils are watered down with additives, fillers, bases, carriers and alcohols. 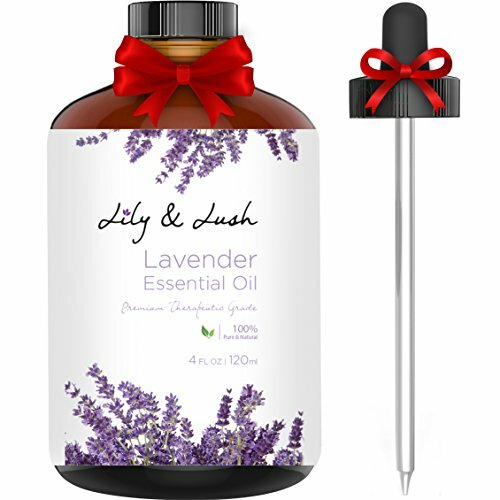 Lily & Lush UNDILUTED, THERAPEUTIC GRADE lavender essential oil is 100% PURE & NATURAL. With no additives, chemicals or parabens. And because comes in a HUGE bottle, at an AFFORDABLE price, it's the BEST VALUE you can buy today! ULTRA-POTENT - 1000s of USES: Because pure lavender aromatherapy oil is distilled from the FINEST QUALITY Lavandula Angustifolia and Lavandula Hybrida, it's the MOST POTENT and MOST AROMATIC. One customer said, "A little GOES a LONG WAY" meaning you'll get more use out of it than any other lavender essential oil - guaranteed. CUSTOMERS FAVE USE? MOTHER NATURE'S FIRST AID KIT: Want to quickly REDUCE STRESS and ANXIETY? Easily accelerate HEALING for burns, cuts and scrapes (even on the kids)? LULL cranky little ones to SLEEP? ALLEVIATE HEADACHES fast? Sooth ACNE, ECZEMA or irritated skin? Lavender essential oil has 1000's of PROVEN USES, while turning your HOME into a RELAXING, ZEN OASIS. WHAT DOES IT PAIR WITH? Love the fresh scent of lavender oil? Add a few drops of our lavender oil for aromatherapy to your diffuser (just 3-4 drops). Mix it into carrier oil and apply topically. Add a drop to your cup of tea to instantly take a deep breath and relax. Or mix it with your other favorite Lily and Lush aromatherapy essential oils to CREATE SCENT ALL YOUR OWN. COMPARE & SAVE - YOUR SATISFACTION IS 100% GUARANTEED: Every drop of our lavender oil is TESTED and BOTTLED in the USA for UNBEATABLE SAFETY & POTENCY. TRY IT RISK FREE for 120 days. Ask our customer care team as many questions as you'd like. Enjoy your FREE copy of the Lavender Oil Digital Guide (19.95 value). You'll feel 100% satisfied with your experience or your money back, no questions asked. If you have any questions about this product by Lily & Lush, contact us by completing and submitting the form below. If you are looking for a specif part number, please include it with your message.